Technical update: The computer is back home after several days in the repair shop. It now works, but it isn't quite its old self. Our photo library, for instance, is weird. The superior husband is working on it some more, but even then, it might be some time before I can access my photos for the drafting series (or offload any more from our camera). 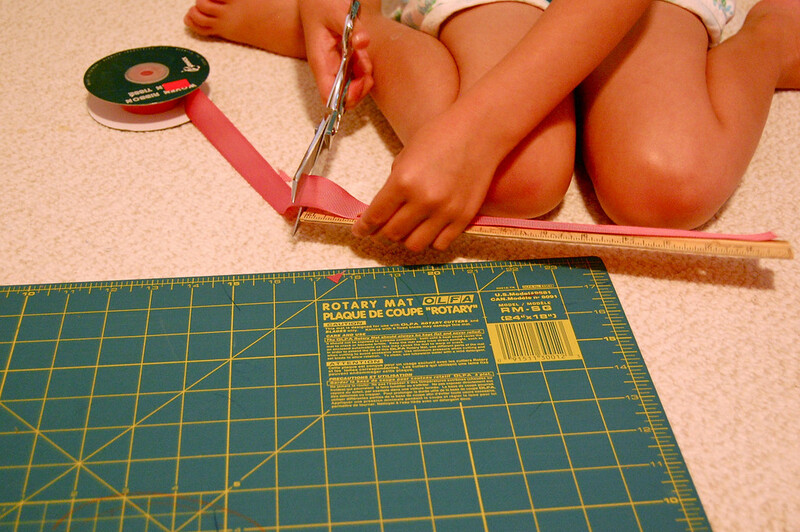 Last week I was in Joann's and Jenna said to me, "Look, Mum - sewing lessons!" I looked - and, true enough, children of varying ages placidly sat at sewing machines, patiently watching an instructor demonstrating er.. whatever it was she was demonstrating. I couldn't resist - I smiled at the instructor when I caught her eye and asked her what they were making. "Pillowcases!" she called back, enthusiastically. High fives for all the parents who enrolled their kids in that class. I'm not sure I would personally want to learn how to make a pillowcase if I were 8 years old, but they were learning to sew, and that is always a good thing. I wanted to hug the instructor, and thank her, and tell her she was Making A Difference In The Lives Of Today's Youth etc. etc. But my children started to run away and I felt obliged to follow at least one of them. 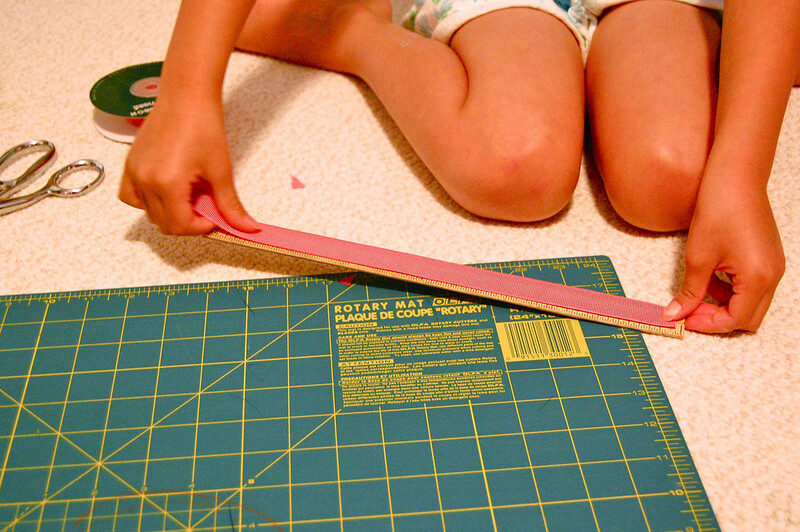 Fast forward to today and Emily said, "Mum, I want to sew something." "OK. How about that blue skirt that's all cut out and ready to put together? Or a small bag?" She picked the bag. And immediately, Jenna wanted to sew too. Kate, thankfully, wanted to continue playing with small plastic Disney princesses. 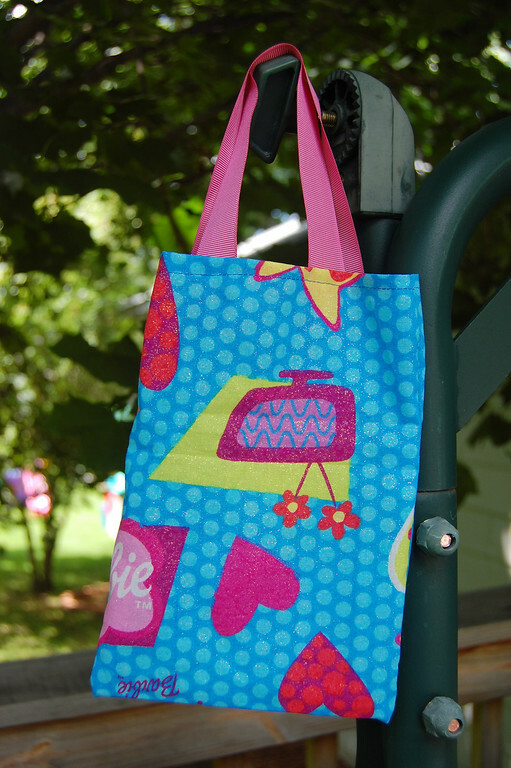 Want a peek into Sewing Class at Chez Ikatbag aka Crazyville? We looked in my stash and found nothing. Emily said, "We need girl cloth and boy cloth. Why don't you have boy cloth, Mum?" "Because I don't have boys." was my clever answer. So we looked in Emily's stash of random fat quarters (all girl cloth) and picked one, which she cut into thirds: "Mum, these are great scissors!" said Emily. "You should stop making me use kitchen scissors to cut my cloth." Then we folded the rest of the fabric, rolled up the ribbons and cleared our workspace before sewing. All hypocritical nonsense, considering the state of the sewing room whenever I'm the one doing the cutting and sewing. But well, "do what Mum says, dears; don't do what Mum does" is the only way the kids are going to learn good sewing habits, I fear. Decided that since Jenna was sewing too, and as these weren't garments, we'd leave the edges raw and not bother with the serger. So I pinned down a hem on each of the short edges, and attached the ribbons. Then I drew, with a marker, the sewing lines right across all those pins. And Emily went first. "Where's that thing that makes you sew backwards?" was her first question. Proud moment #1- not only did she remember what the machine did, she was even sounding exactly like her momma, who also doesn't know what most of the machine parts are called. Four lines of straight-stitch, most of which she did on her own (and I could take photos) and she was done. She said, "I need to make 10 bags, mum. I want to give them away to my (ex)classmates and sell some at a garage sale. Jenna can help sew." Proud moment #2 - my children have inherited my mass-production genes. Kate sashayed over, took a ribbon, sat at the sewing machine, declared, "My sew ribbon!" and started to press buttons. Quickly unplugged the cord from the wall socket and explained that she'd have to wait till she was slightly older. Then it was Jenna's turn - she floored the pedal and said, "Erm, too fast? He he he." 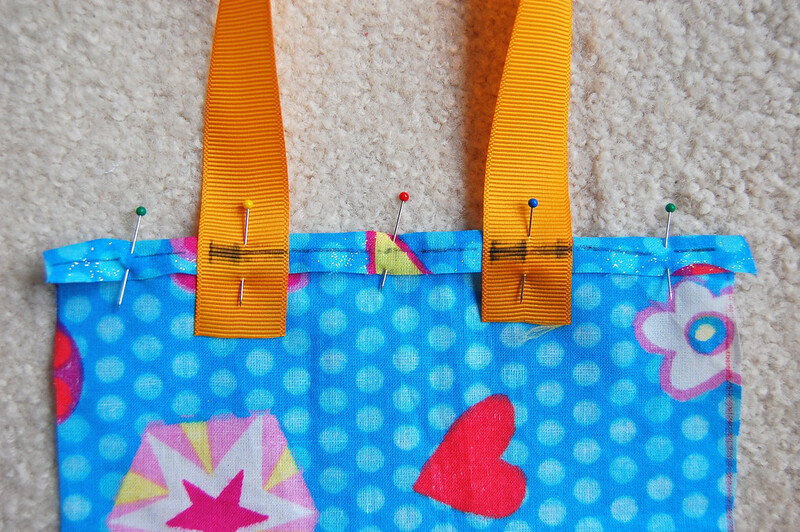 I helped her guide the fabric under the needle and she sewed her own bag. When she had finished, she ran away to play with something else. Kate came up and grabbed the bag and filled it with "(s)parkle markers that are (s)quishy" (glitter glue pens). And sped off with the hijacked bag to the car for the ride to the supermarket. Breathless! I had to sit down on the floor (full of fabric scraps, ribbon fragments and plastic princesses) to collect myself when it was all over. Not at all like that peaceful JoAnn sewing class. My students are getting younger and younger. I can barely keep up. But they are learning to sew. And that is always a good thing. I loved it! Your girls are so blessed to have a mom like you! 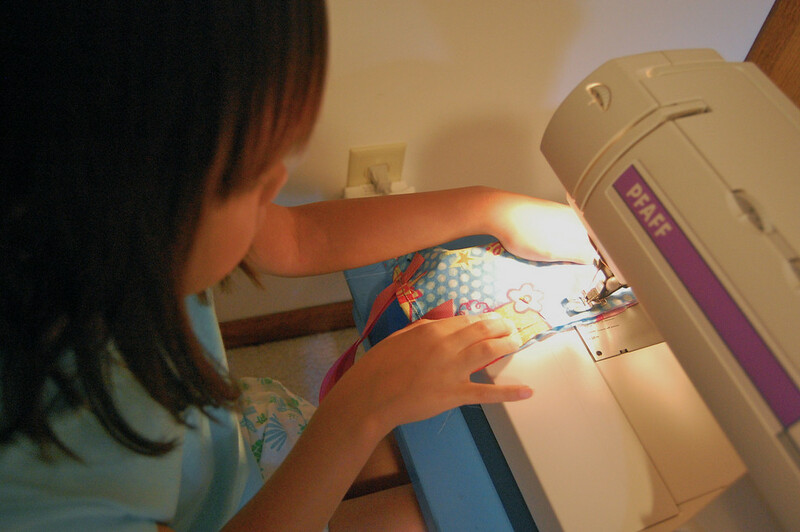 A three year old at a sewing machine - you are brave!! Great to see the girls have inherited your genes. Can't wait till they have their own blogs! Mike's mom has this amazing little doll that Mike sewed on a machine with help from his grandma when he was TWO. The guy should have kept on sewing. I'll have to take photos of it next time we're visiting. Great idea! a project that is easy to complete at one time even with short attention spans! I think it's so important to make the first projects simple so kids feel success and come away with positive feelings. It makes them want to do it again. I think I'll try it with my grand-daughter. 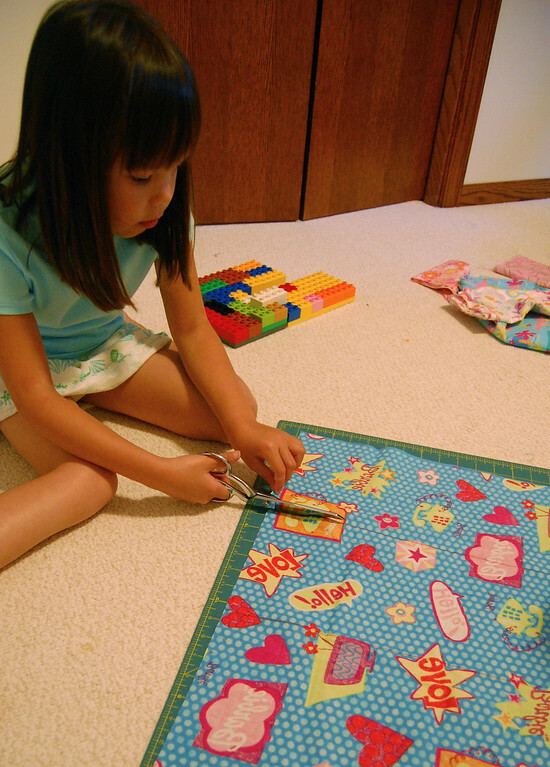 Her first project was a pillowcase for her little sister's birthday (which she promptly borrowed and started using on her bed.) She was so proud of her accomplishment. 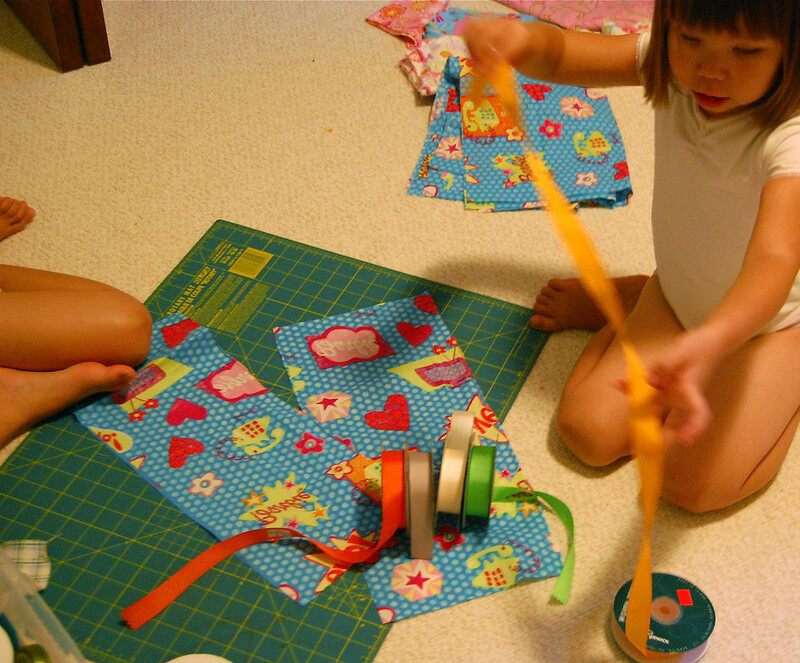 I loved it when my daughter started learning to sew. We even bought her own machine. She sews all kinds of things now. It's fun to pick out fabric together. My kids 16, 12 and 10 have been sewing since they were 3. For the past 3 years they have been making cotton pillowcases for medically fragile children. WHY? A study showed children with cancer who were given a homemade fun fabric pillowcase did better in their hospital treatment than kids on plain white hospital pillowcases.In our house Homemade Pillowcases ROCK! They also mean love. For this past Christmas my son (11 at the time) made everyone pillowcase sets, sisters, parents, etc, etc. Well done, Emily and Jenna! That's a very good looking bag! I read this and laughed. My house is the same whenever I try to do a project with my kids - execpt my middle one is a boy who just wants to make the machine go as fast as possible. 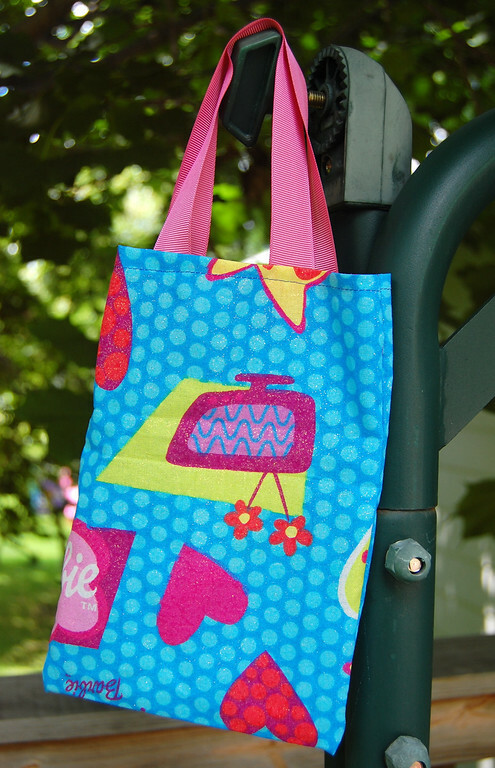 Get Kate a Janome Sew Mini! I actually reviewed it on my blog, if you'd like to read a more detailed discussion, but it is absolutely perfect for little sewists! Love it! Must try my granddaughter on something so quick to make and useful too - maybe she'll just manage to get it finished before her attention wanders, lol. OMG!!! i love this!!! i love your bag too. it came out great! very funny!im gonna make a bag like this too. cant wait!LOL!! !